THE MUELLER INVESTIGATION “did not find that the Trump campaign or anyone associated with it conspired or coordinated with Russia in its efforts to influence the 2016 presidential election”, US Attorney General William Barr has said. The Attorney General received a copy of Mueller’s report on Friday, and said in a letter this evening that he was advising of the “principal conclusions” of the report. 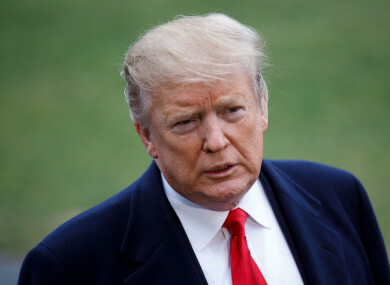 In a statement following Barr’s letter, the White House said it’s a “total and complete exoneration” of President Donald Trump, but some politicians claimed otherwise. The report from special counsel Robert Mueller “thoroughly investigated allegations that members of the presidential campaign of Donald J Trump, and other associated with it, conspired with the Russian government in its efforts to interfere in the 2016 US presidential election, or sought to obstruct the related federal investigation”. Representative Jerrold Nadler, chairman of the judiciary committee, said “must be full transparency in what Special Counsel Mueller uncovered to not exonerate the President from wrongdoing”. However, the White House Press Secretary Sarah Huckabee Sanders said in a statement that it’s a “complete exoneration” of the president. While it doesn’t find collusion between the Trump campaign, Mueller’s report does focus in on efforts by Russia to disrupt and influence the election campaign. This included “gathering and disseminating information to influence the election”. Furthermore, evidence gathered in Mueller’s investigation “is not sufficient to establish” that President Trump committed obstruction of justice. In the summary from Barr, he said Mueller’s team issued more than 2,800 subpoenas and executed nearly 500 search warrants in its probe of Russian interference in the 2016 election and any potential involvement by President Donald Trump’s campaign. Barr’s summary this evening comes without the publication of Mueller’s report. The Attorney General’s letter now marks the conclusion of the 22-month investigation by Mueller, a former FBI director, into allegations that Trump’s election campaign coordinated and colluded with Russians to skew the 2016 vote so the billionaire real estate magnate would win. But it also marks the beginning of a new phase: the determination of Democrats in Congress to further investigate Trump, using the evidence from the Mueller probe. “Seems like the Department of Justice is putting matters squarely in Congress’ court,” tweeted the Democratic representative Nadler. Email “Mueller probe does not find that the Trump campaign conspired with Russia on 2016 presidential election”. Feedback on “Mueller probe does not find that the Trump campaign conspired with Russia on 2016 presidential election”.